Hundreds and Thousands. Can you see the flower shaped formation? Each petal is a different colour. Hundreds and Thousands was my entry into the Alive with colour - Professional section at the recent New Zealand Quilt Symposium held in Palmerston North. I have used the traditional origami bow tie block but have inserted the bow tie center (3d) into each corner rather than every second row. It's very tactile to touch and technically fiddly. Each row took me two hours to sew and each piece of fabric was 2" square. For the symposium Gala dinner I made a bag to match my dress using this technique but with 2 1/2" squares. One side of my bag - background in black foreground feature fabric. in place and prevents the bag fabric from sitting on any surface. To learn this technique we will be making a panel using 3" squares. Your final piece/panel can be made into a cushion, bag or wall hanging - whatever you like. The background is your base. You can use one fabric (i.e. pink cushion) or various fabrics in the same colourway (i.e. green cushion). Please pre-cut 36 x 3" squares. The foreground is your accent. It should complement your background fabric but stand out / pop (i.e. light vs. dark or a strong contrast). Please pre-cut 25 x 3" squares. 1 x 20" piece of batting. This initially will be your design board for laying out and pinning your design. Once your panel has been sewn it is then quilted onto this piece of batting. Pins - you will need plenty. Dress making pins are fine. If you use long thin quilting pins for normal piecing - these will bend. Quick n pick. We use this to assist us in interlinking our rows together by removing stay stitches (usually 1 or 2 per block). Don't' forget it - it is a requirement. A camera, ipad or mobile phone for taking photographs of different placements. Machine thread for piecing and for quilting - must match or blend with your fabrics. Scissors or snips for cutting thread. Cutting board, rotary cutter and ruler. Sewing machine with 1/4" foot. Walking foot (for sewing the panel onto batting). This may or may not happen in class depending on time. A lot of time maybe used in laying out, so to save valuable time please come with your fabric pre-cut. Pre-wind your bobbins and please make sure you have a new size 80/12 needle in your machine. and the foreground is made of scraps of Kaffe Fasset fabric. 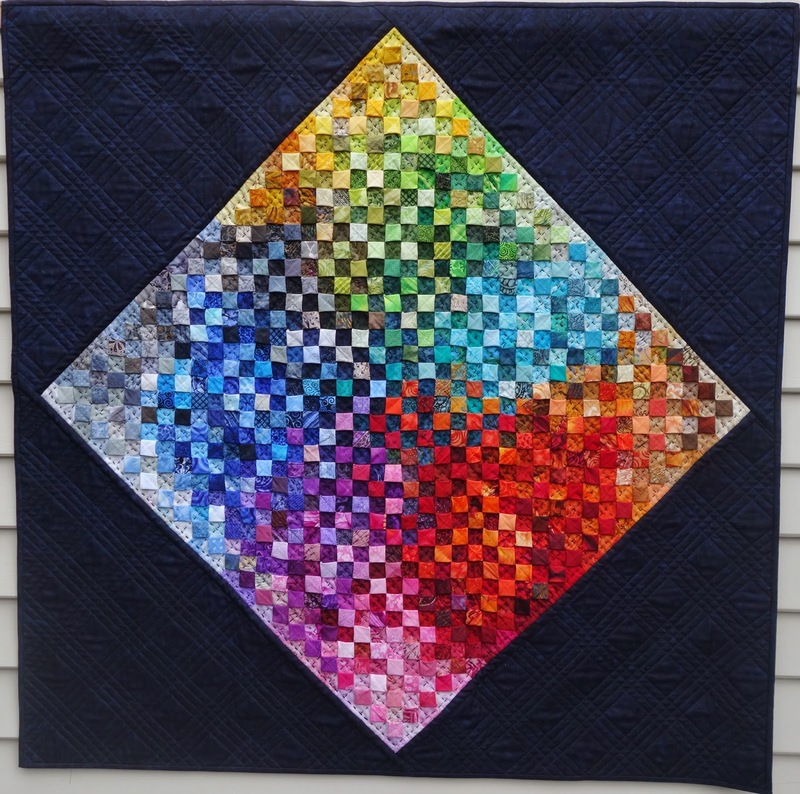 This is a fun technique but some quilting experience is required for this class.